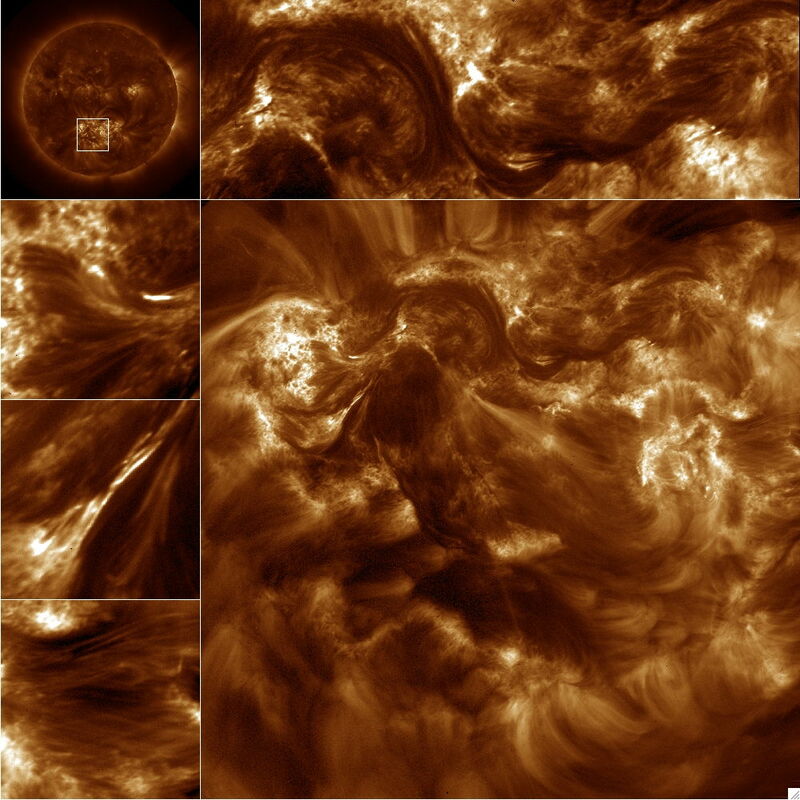 The Hi-C imager targeted the region of the Sun shown in the top left image from SDO. The border images are subsets of the large image recorded by Hi-C and show the filament-like nature of the observed region (Credits: Amy Winebarger/NASA). On January 23, NASA announced some surprising results from a sounding rocket experiment conducted last year. The High Resolution Coronal Imager (Hi-C) was launched on July 11, 2012 and collected just over 300 seconds worth of data before falling back to the ground. In that time, the targeted 24 cm Cassegrain telescope sporting cutting edge optics was able to zoom in on a specific active area of the solar corona, attaining fives times better resolution than the Solar Dynamics Observer’s Atmospheric Imaging Assembly. The images allowed scientists to draw new conclusions about the composition of the coronasphere, that can now be seen to incorporate heat-generating “magentic braids” of plasma that may help explain why the corona is hotter than the Sun’s surface, even though far above it. It is hoped that the insight may lead to better understanding – and perhaps forecasting – of solar flares and other surface phenomena.